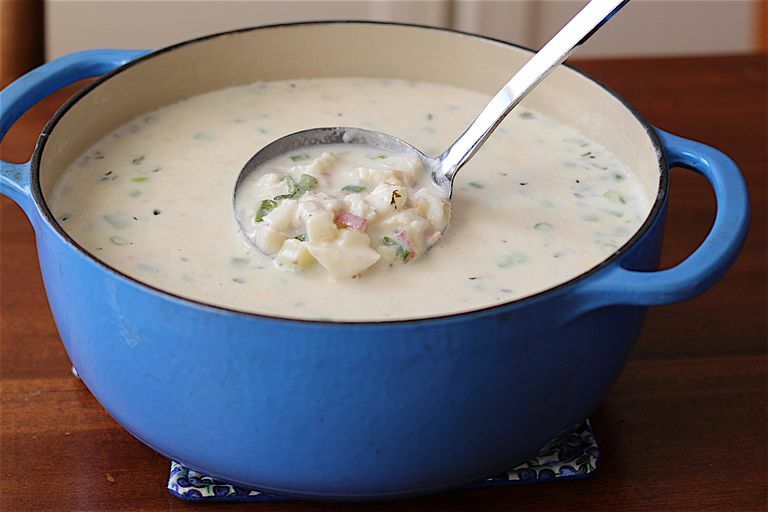 Every cook has a favorite fish chowder. This one is reminiscent of those often served in New England chowder houses, with a thickened base rather than just milk. Instead of flour as a thickener, this version uses potato flakes to reach a creamy consistency, with or without the cream. Heavy cream has very little lactose, so there is no need to seek out a lactose-free version for the small amount in this recipe, to keep it low in FODMAPs. In a large Dutch oven or stockpot over medium-high heat, melt the butter. Add Canadian bacon, celery root, parsnip, and fennel; stir periodically until vegetables brown slightly, 4 to 5 minutes. Add the potato flakes, clam juice, and water and stir until potato flakes dissolve about 1 minute. Stir in the milk, potatoes, ¾ of the scallion greens, thyme, bay leaf, salt, and pepper. Bring the pot to a low simmer (do not boil) and cook until potatoes are just slightly underdone about 12 minutes. Stir periodically to prevent vegetables from sticking to the bottom of the pot. Add the fish and simmer until fish becomes opaque white and flakes easily, 5 to 8 minutes. Add the cream and the remaining scallions; simmer 1 minute. Remove the bay leaf from the broth before serving. Replace cod with any other mild white fish such as tilapia, haddock, or flounder. Swap out Canadian bacon for 3 ounces diced bacon strips (about 3 pieces). In this case, omit the butter and sauté bacon before adding vegetables, until the fat renders about 1 minute. Then add the chopped vegetables and proceed with the recipe. Replace scallions with ½ cup finely chopped leek leaves, adding all of them along with vegetables. Celeriac is also known as celery root, in case that is what it is labeled as in the grocery store. When purchasing potato flakes, read the label carefully to avoid a product with added garlic or onions, which are high in FODMAPs.